Beautiful new cover design for this internationally acclaimed book that has sold over one million copies worldwide. Marianne Williamson shares her insights into how the practical application of love every day can provide an answer to the problems that confront us, whether these are in our relationships, our careers or our health. 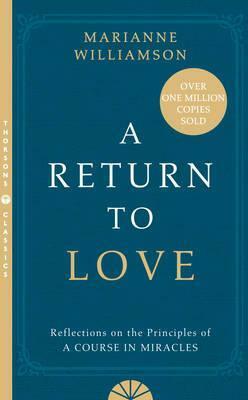 A Return to Love is based on the author's experiences as a teacher and lecturer on the self-study guide A Course in Miracles. She explains how applying the principles of love to all difficulties can aid in healing and bring about a personal transformation of the reader. In this practical guide, she reveals how you can bring universal spiritual principles into your everyday life by accepting God and expressing love. Whether your `pain' is in the area of relationships, career, health or emotions, this book shows you how love is the key to inner peace, and how by practising love we can make our own lives more fulfilling while creating a more peaceful and loving world for our children. With practical exercises to encourage you on your own spiritual journey, this is an inspiring guide to how to live a more whole. fulfilling and spiritual life. Marianne Williamson is an internationally acclaimed author and lecturer. Her work focuses on spirituality and the process of bringing spiritual themes `down to earth'. She has published eight books, four of which (including A Return to Love and Everyday Grace) have been #1 New York Times bestsellers. Marianne has lectured professionally around the world since 1983, and has been a popular guest on numerous television programmes such as Oprah, Larry King Live and Good Morning America. Seen as a guru by many of the biggest names in showbusiness, she also works extensively for non-profit making charitable organisations.